Citrix Cloud Center : Why Citrix Cloud strategy makes sense! * Inter-operable gateway-hub model is the key to Citrix's strengths within any CIO and CISO's discussion. This breaks a lot of discussions loose and focuses on many aspects that we have still not been able to address within the enterprise. think of Security, Compliance, Ownership etc. 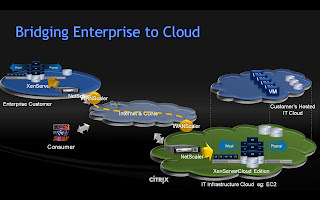 This Internal Cloud vs External Cloud Model is an excellent way to break away from traditional IT barriers where its needed and keep the ones within the internal cloud domains which cannot be transported and hosted on an "External Data Hotel". My upcoming speech at CloudCamp is something I'd like to welcome you too. We will talk about Visualization, Security, Compliance and several Cloud Computing models. For now, get yourself washed with the VMworld fizz. Anyways here's a peek at Simon's session where he'll explain in detail what the whole Cloud madness is all about.